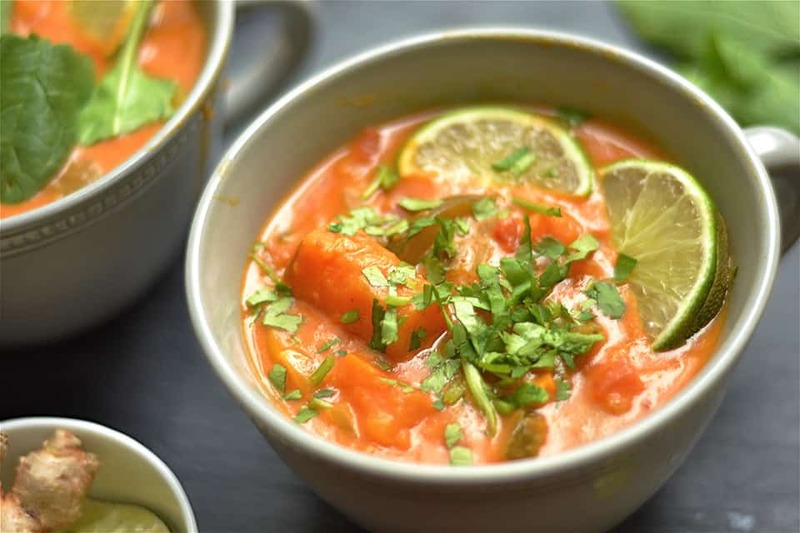 This rich and creamy Sweet Potato Curry Stew is full of vegetables, nutrients, and delicious flavor! 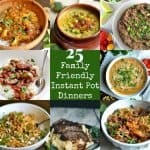 It’s also so easy to make in your Instant Pot or Slow Cooker! For my regular followers, you are probably not surprised that I have a Vegan Whole30 recipe up today. While I have enjoyed this Whole30 journey and love the sugar detox, I must admit, it can get a little too “meat-y” for me. Because one of my Amy rules for a nutritious life includes eating vegetables with EVERY meal, I have been eating vegetable based lunches and dinners on Whole30. They are some of my favorite dishes! Just making up for those years as a vegetarian where I ate boxed mac and cheese and pasta……… And it’s also my friendly reminder that veggies are the most important part of your Whole30 diet. I’ve had to remind my husband this a few times when he reaches for bacon as a snack! 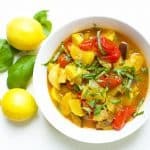 This super easy curry was something I have been wanting to make since I started Whole30 two weeks ago. I had intentions of doing a regular veggie curry with cauliflower rice, but the consistency turned more into a chunky vegetable stew. 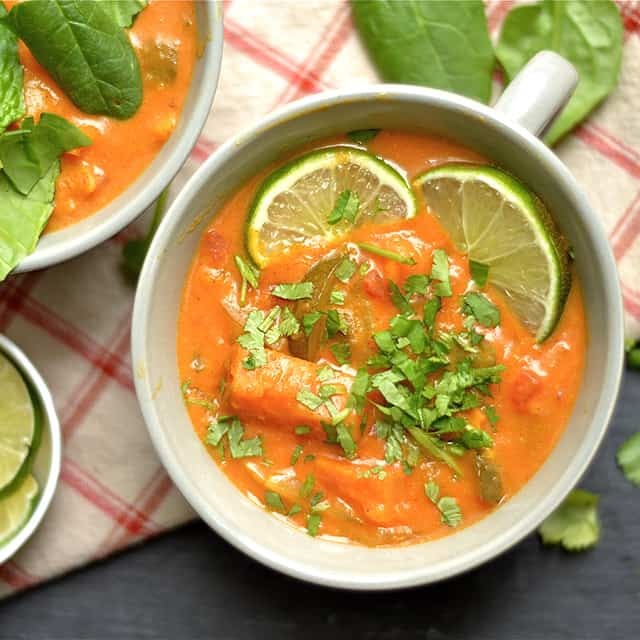 Creamy coconut milk with sweet potatoes, ginger, several vegetables, diced tomatoes, spices, and lime juice round out this bowl of deliciousness! I couldn’t quite call it a soup because it is so thick, and if you feel inclined to serve over cauliflower rice, I am sure it would be delicious. Definitely not necessary. What is necessary is the lime juice and fresh cilantro. The sweet potatoes really sweeten the stew, but the acidity from the lime balances this soup out perfectly! Enjoy this bowl for lunch or dinner. It can be enjoyed up to 5 days after it is made, so it’s perfect to make ahead and eat as a lunch throughout the week. Or you could add it to your dinner rotation for a Meatless Monday idea. 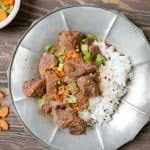 Begin by selecting the saute function on your Instant Pot. Once hot, add oil and onion. Cook for 3 minutes or until onion is fragrant and translucent. Add ginger and garlic, cook for another 1-2 minutes. Add remaining vegetables, and diced tomatoes. Mix in spices, salt and curry paste. Slowly fold in coconut milk and continue to mix until everything is well incorporated. Press cancel on your Instant Pot. Secure the lid. Select the manual function and cook on high pressure for 5 minutes. Use a quick release. Open lid once pressure is released, stir in lime juice. Place all vegetables: onion through bell pepper into your slow cooker. Mix spices, salt, and paste in a bowl with diced tomatoes. Pour on top of your vegetable mixture. Now mix in the coconut milk. Top with the lid and cook for 4 hours on low or until vegetables are softened. 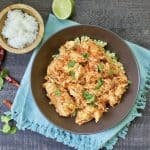 Stir in lime juice and serve with garnished cilantro. If doubling the recipe, is the cook time the same? This is good, but, it’s not a curry. It’s a soup. In fact, just about everything I make in my InstantPot, following recipes, turns out as soup. Even oatmeal! I’m back to pots and pans. I could not get the recipe to print, so wrote it all down. I hope it will be cooked enough using the quick release. 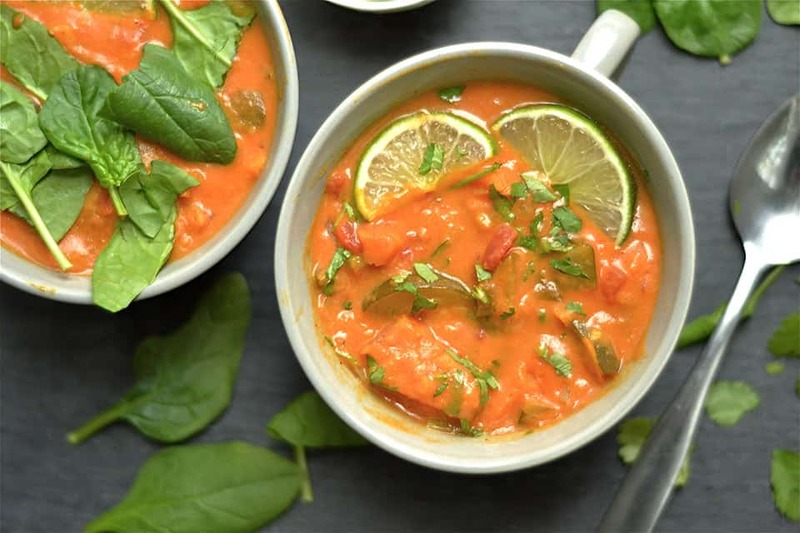 I use the natural pressure on a lot of soup recipes and it works great. You can leave the oil out and just use a bit of water or stock to saute also to keep it WFPB friendly also. Hi Steffany! Thanks for your comment and sorry you couldn’t get the recipe to print. It works great to print from a smart phone, but a little more tricky on a desktop. Trying to fix this. Hope you enjoy the soup! And you can definitely use a natural release too. OK I finished making it. In Canada we have ml for cans not oz but I put a larger can of diced tomatoes, and one can full fat coconut milk, and one can lite coconut milk, and the juice of 2 large limes. It turned out very tasty. I would definitely make it again.